Well, here we are at the start of 2014 and for course 9, on the last leg. I'm not alone on this course so I'm sure we're all beavering away. Good Luck everyone! Nearly there ! 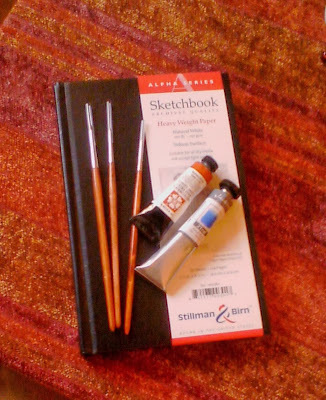 Just taking a little time out today to acquaint myself with some new stuff from Jackson's Art Supplies, a late Christmas present. My parcel arrived yesterday and here's the photo. A new sketchbook, some Spotter brushes - never tried them but should be useful for tiny detailed bits, and some paint - Jackson's Cobalt Blue, absolutely gorgeous, and DS Quinacridone Deep Gold, so rich and transparent and just an amazing colour. Don't you just love new art stuff ?